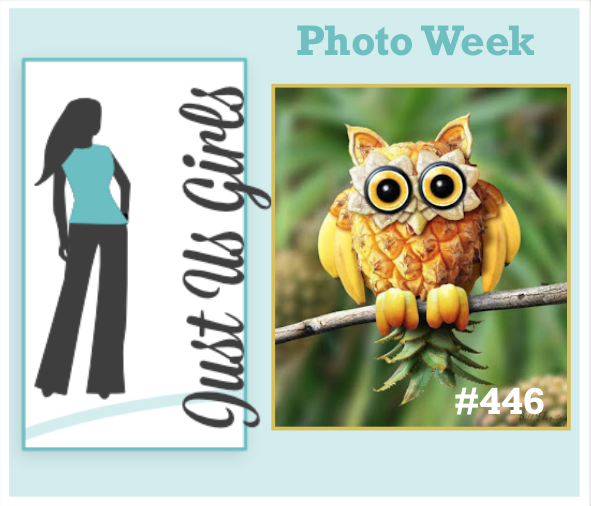 Hello, Have we got a fun Inspiration Photo for you all this week at Just Us Girls! Isn’t it the cutest owl you have ever seen? Well, made out of fruit that is! LOL. I really enjoyed getting out my Owl punch from SU to put this card together. I also, used my MFT cloud stencil for the background and this fun stamp set that I have used for my branch and blossoms is from Darcies. The sentiment, leaves and tags are from my Verve collection. The leaves aren’t uniform, I just realized….some are round and some are pointed. LOL The leaf paper is from Gina K.
I am also linking my card up over at The Card Concept where they have the cutest owl pillows as their inspiration. I pulled out the bright colors for my blossoms and of course the owls themselves. I guess you would call this Clean and Layered. Categories: Cards | Tags: anniversary, Card making, Cards, Owl punch, rubber stamps, stamping, Stamping Up, Verve Stamps | Permalink. Great card and s beautiful take on the inspiration photo. Oh I just love the red! This card is so awesome! 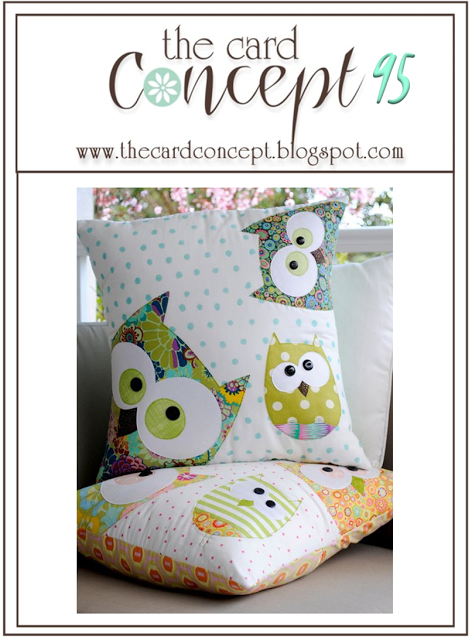 Great job and btw I want those owl pillows! LOL! 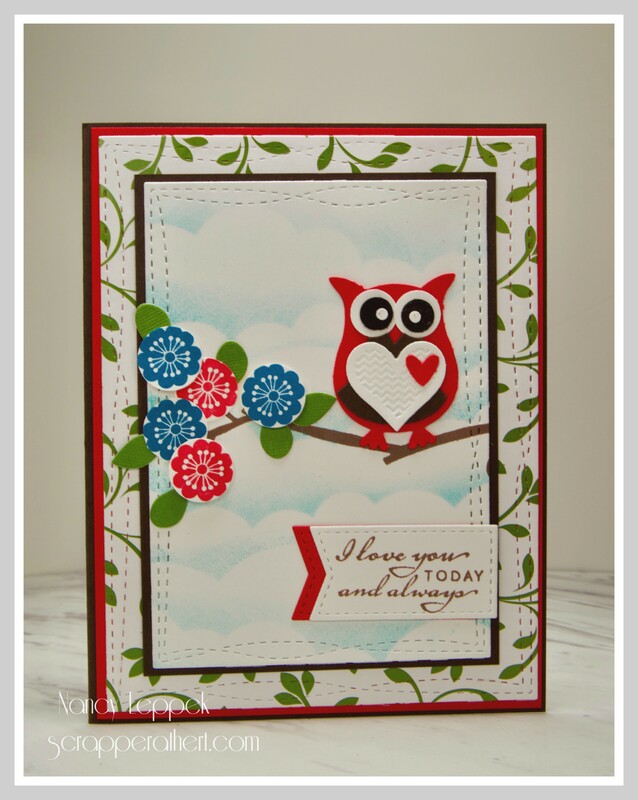 Love your card – your owl is just so darn cute and the colors you used are perfect!!! So sweet! I love owls of all shapes and sizes, Nancy, and this one is in my favorite colors. What a brilliant beautiful colourful card here Nancy. That owl is so cute with the hearts. Stunning cloud formation. Just gorgeous! This is so sweet and I love that your hubby commented! That owl is adorable with the heart on his tummy. Love how he is perched on the flowery branch and that background with the leaves is perfect for this. Nice chatting with you on Saturday about your hubby’s cousin! Can’t wait until next summer to meet you! You and I had similar ideas! I had forgotten all about that owl punch! I think I may have it in my collection! Your card is so cute! Love all the pretty colors!